Roy Frederic Spreter was another of the gifted group of painters who made advertising art their special province. 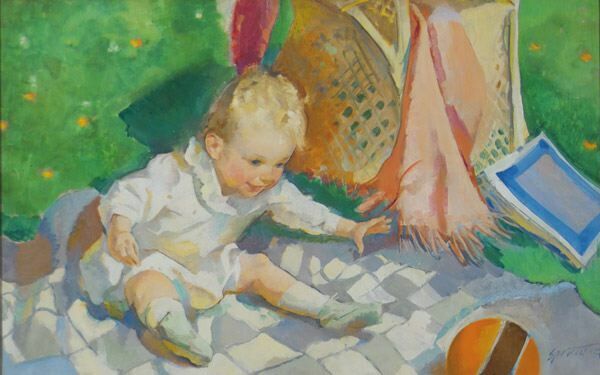 Spreter’s work was distinguished for the subtlety of his color and values and the good taste which his art conveyed to the advertiser’s products. He was long associated with the campaigns of Camay, Campbell’s Soup, and Bon Ami, and in demand as an artist for twenty-four-sheet billboards, which require sure control, since the reproductions enlarged the original art from eight to ten times. His fiction illustration, equally colorful and artistic, was mostly for the women’s monthly magazines, where his sensitive and beautiful heroines found much favor. A Chicagoan, Spreter had brief training at the Art Institute there, but learned most from Joseph Chenoweth, Philip Lyford, Leopold Seyffert and other members of the Palette and Chisel Club. He was a member of the Art Directors Club and the Society of Illustrators in New York.